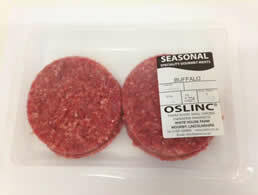 To compliment our range of Gourmet Burgers we now make Buffalo Burgers made from 90% Buffalo Steak Meat. A very health and tasty alternative to beef. The burger is high in nutrients such as protein. Supplied in cartons of 2, 8 and 25.